After two years of hard work, San Jose Bike Clinic is getting a space! We are proud to announce we will be opening up shop this Saturday, November 1st at Camera 12 (201 S 2nd St, San Jose) from 12 noon to 7 pm. We hope you’ll drop in and check it out! 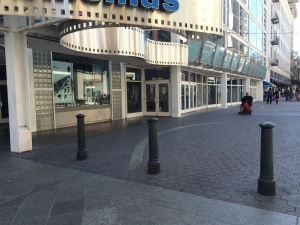 It took a lot of hard work and a bit of luck for us to finally make it to the point where we can open up shop. I am very proud to be a part of a grass roots organization that has made it this far, and look forward to what we’ll do with this new space and where we’ll go from here. I want to give a special shout out and thank you to our volunteers that put in the sweat to make the dream come alive, as well as our fiscal sponsor SVBC, and to our community for coming out to pay the Bike Clinic a visit. We hope we’ll see you soon! 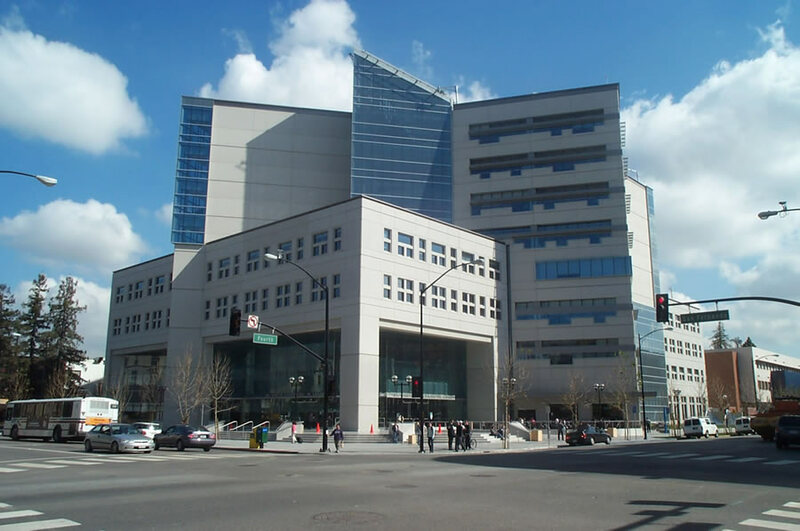 San Jose Bike Clinic is popping up shop once again for all your bike repair and education needs at our monthly Skill Share at San Pedro Square Market! Come work on your bike, learn about bike repair, teach others what you know, or just hang out with some bike enthusiasts. We will have tools, work stands, expert mechanics and some essential spare parts like inner tubes and cables to help you with any repair you might need. Want to volunteer? We need help with setting up, outreach, signing people up and teaching bike repair skills. 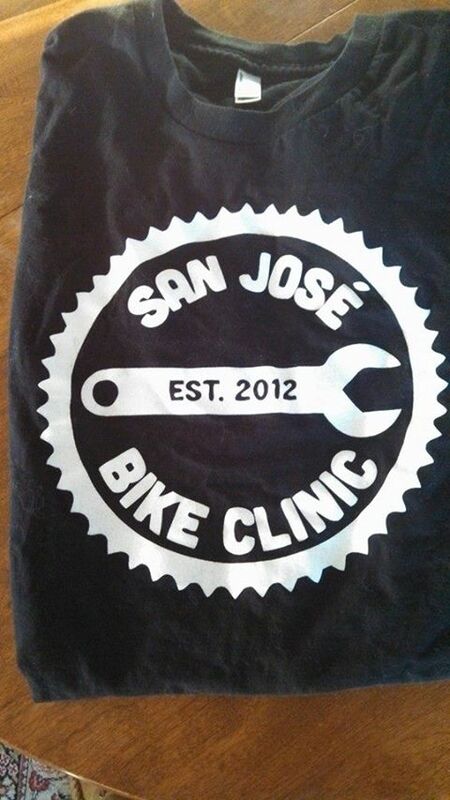 RSVP via this form, and thank you in advance for making San Jose Bike Clinic happen! Need the perfect gift for the bike and San Jose lover in your life? 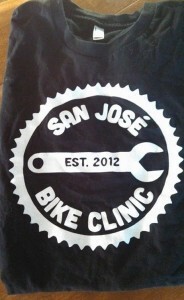 A San Jose Bike Clinic T-shirt would be just the ticket, and we’ll have a variety of sizes for men and women at the Skill Share. Start the New Year off Right—Get Involved with Bike Clinic! This meeting is where we discuss the ins and outs and strategic plans of SJBC. Want to learn bike repair skills and—even better—how to share what you know at our Skill Shares? These trainings will get you ready to teach basic to intermediate bike repair skills. We need a small army of volunteer mechanics when we open our community bike workshop, so invite a friend! We count on our amazing volunteers to plan events and spread the good word about safety and bike maintenance. Want tips on how to do bike outreach with SJBC? Want to pitch an event? Bring it! We’ll be hosting another free training for Bike Clinic volunteers on Thursday, December 12 from 7-9 at Arthur’s shop in Willow Glen. If you’re interested and available, RSVP ASAP through this Google form or email sjbc@bikesiliconvalley.org if you have any questions. Arthur Rodriguez, owner of a bike repair education business called Bike Teacher, is offering a training that’s free to all SJBC volunteers—past, present and future. Our focus is on putting tools and knowledge in the hands and minds of our members and participants. So you’ll not only learn how to do basic repairs, but also how to share what you know and pay it forward. We’re always building our team of volunteer mechanics to teach bike repair skills at events and when we open a permanent space, and we want you to join us. These trainings are a great way to get involved. Wheel hub and bottom bracket maintenance, with a focus on diagnosing problems. This is especially important in rainy weather and with older used bikes. Handlebar wrapping. Need this done? Bring handlebar tape and your bike! Generally get familiar with your bike, repairs and adjustments. We’ll teach you parts and tools vocabulary along the way, or answer any questions you have. Get a SJBC 101 overview so you know what we’re all about. We will have some tools on hand to share. See you there! Do you remember who taught you what you know about bike repair? Want to give back and pay it forward? We need volunteers for these upcoming Bike Clinic events. And if you’re not ready to volunteer, come say hi or bring your bike down with any questions or repair needs you have. San Pedro Farmers Market on Friday, November 15. To sign up, email sjbc@bikesiliconvalley.org and we’ll plug you in. Mechanic 9:30 a.m. to 12 p.m.
Outreach 9:30 a.m. to 12 p.m. Mechanic 12 p.m. to 2:30 p.m.
Outreach 12 p.m. to 2:30 p.m.. Monthly Skill Share at San Pedro Square Market 11/21 7 p.m. to 9 p.m.
We’ll need a few mechanics with at least basic repair skills, plus a few outreach volunteers to talk about SJBC and cycling. To sign up, email sjbc@bikesiliconvalley.org and let us know how you’d like to help. For every event that we put on, we enlist an Event Lead. Event Leads are responsible for making sure that our table is set up and we have the tools that might be needed to repair bikes. Have ideas for an SJBC event? Pitch it at the next Outreach meeting. Want to be in charge of an upcoming SJBC event? Read on! Volunteers past, present, and future are welcome to chat about just about anything. Find out how to get involved with upcoming projects in SJBC. There are also two more mixers coming up. Make sure to RSVP! 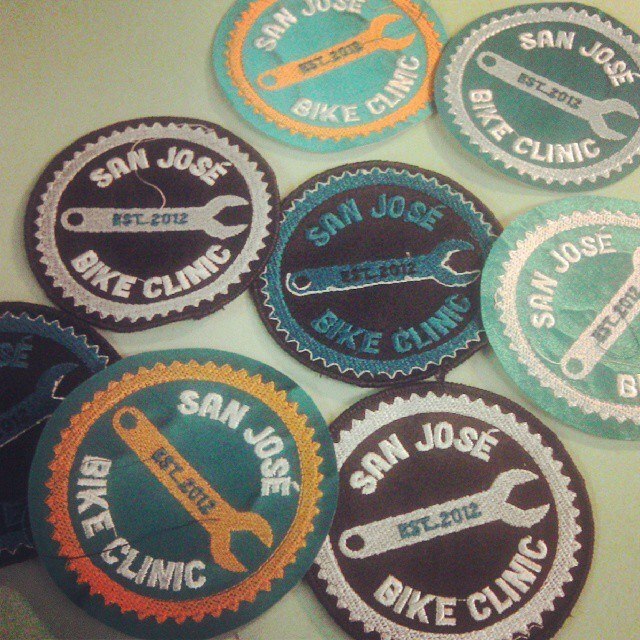 San Jose Bike Clinic’s next Skill Share is Thursday 10/17 from 7-9 pm at San Pedro Square Market, just before Halloween. Invite your friends to the Facebook event: https://www.facebook.com/events/225514150942277. Bike Clinic’s Skill Share will get you ready for San Jose Bike Party’s Dia de los Muertos ride on 10/18 and for a safe Halloween. A bike is a fun, convenient and safe way to get around on Halloween and if you’re going to Halloween parties. Come get your bike tuned up for the festivities. 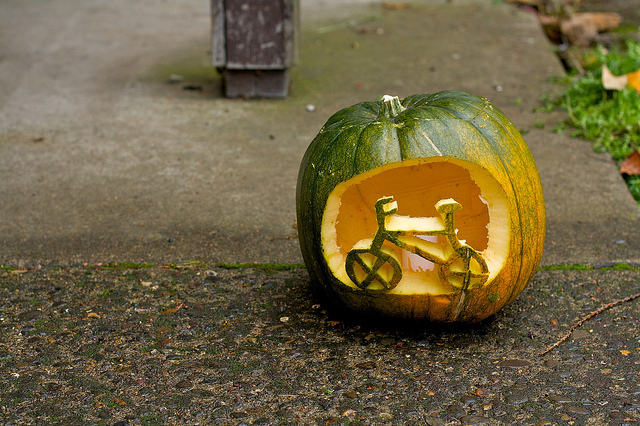 Even better, if your bike is a part of your Halloween costume, come work on your creation or show it off! If you’d like to volunteer, we need a couple more mechanics with basic bike repair skills like adjusting derailleurs and brakes, plus another outreach volunteer to staff the table, sign people up for repairs, talk about SJBC and biking. Come share your skills and help people learn to fix bikes! The commitment would be from 6:45 to 9:15, to help us set up and pack up. Email sjbc@bikesiliconvalley.org if you’d like to help.